This will be one of three entries Curt has in the 2018 Prix de West Invitational. 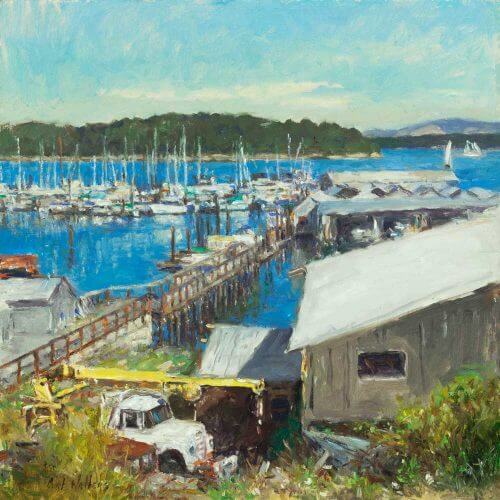 Painted on location in Washington state, Curt captures the essence of a working boat yard. Living in southwest, surrounded by rock formations and fantastic desert vistas, Curt takes advantage of every opportunity he gets to paint the water and coastal scenes. His trip to Washington state and British Columbia last year was no exception. It was a beautiful day at Friday Harbor in the San Juan Islands when Curt chose to stop in a parking lot and add this view to his list of coastal paintings. You can see Curt painting this on his most recent video presentation created for his talk at the Tacoma Art Museum in April of this year.